Sound Devices has announced the launch of two new interfaces to its ultra-portable audio interface range; the MixPre-3M and MixPre-6M. Joining the existing MixPre-10M in the M-Series, both 3M and 6M models feature the same 12-track (up to 96kHz/24-bit) recording capabilities as the 10M, but with fewer inputs for simultaneous recording. Other key features of the M-Series include; overdub, track laying, punch in/out, bounce, reverb, vocal air, and metronome. While the Kashmir™ mic preamps and ultra-low-noise A-to-D architecture take care of the excellent transparency associated with Sound Devices products. 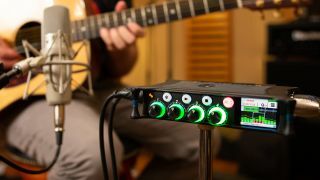 The new field-recording interfaces are aimed at songwriters, with the main differences being the 3M’s three XLR inputs and a 3.5mm Aux-in connector, compared to the 6M’s four XLR/TRS inputs and 2-channel 3.5mm Aux/Mic connections. Both the 3M and 6M are available for $549 and $799, respectively. Check out the Sound Devices website for more info. For existing MixPre-3, MixPre-6 and MixPre-10T users, Sound Devices has also released a Musician Plugin. For $99, the Musician Plugin adds all the musician-inspired features of the M-Series, including overdub, punch in/out, track-laying, bounce, reverb, vocal air, and metronome. The plugin can be purchased from Sound Devices' new online store.